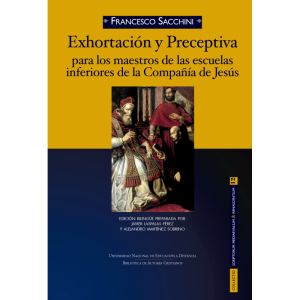 Two 17th-century handbooks by Francesco Sacchini, on his method of teaching in Jesuit lower schools, are available with the new bilingual volume Exhortación y preceptiva para los maestros de las escuelas inferiores de la Compañía de Jesús. The work is co-edited by Javier Laspalas of the Universidad de Navarra and Alejandro Martínez of the Universidad del País Vasco/Euskal Herriko Unibertsitatea. It is published by Biblioteca de Autores Cristianos in collaboration with the Universidad Nacional de Educación a Distancia. Laspalas and Martínez provide an extensive introduction to Sacchini (1570-1625) and the context for his pedagogical theories. The first handbook, presented here in the original Latin and in a new Spanish translation, consists of three parts, including Sacchini’s consideration of the “dignity” and “utility” of the education of children. The second handbook, also appearing in both Latin and Spanish, has chapters on the more practical matters in the classroom, such as how a teacher was to serve as an example to his students and how he ought to distribute prizes, punishments, and reprimands. Biblioteca de Autores Cristianos provides the volume’s full table of contents and a selection from its introduction online (http://bac-editorial.es/normal/1547-de-modo-addiscendi-sobre-el-modo-de-aprender.html).